Hooray! We’ve make it to Friday! That means we’ve made it to another Foto Frenzy. This one promises to feature some stunning fotos and why wouldn’t it? The fotos of Nicky are in another folder. HAH! We’re gonna start your Foto Frenzy picks with #4500, chosen by one of my Twitter furrends, Bode's (@4catsstrapski) Mom. Bode went OTRB a year ago but we still love him very much. Angel Bode is always trying to help animals who need forever homes. We applaud that. 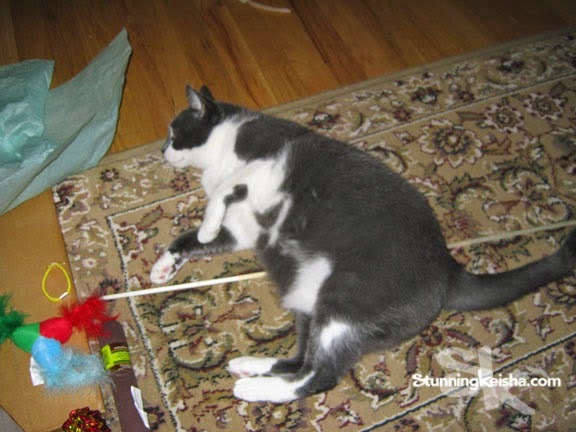 In this foto, I’m in the foyer ignoring some of my toys that TW desperately wants me to play with and waiting for that tissue paper to jump on top of me. What’s the chance of that happening? 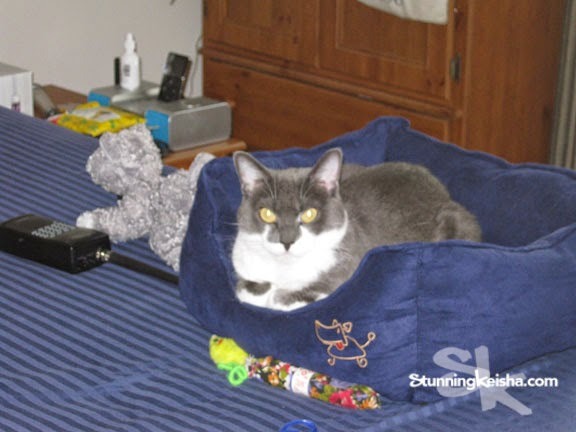 Pretty Annabelle and her fursibs who blog at Manx MNews selected #487, showing me in my blue “mauve thing” on Pop’s bed. Cat beds have been called “mauve things” in our family since the original bed was—you guessed it—mauve. Legend has it, the peeps had never heard of the color “mauve” and thought it funny. I’m glaring at TW cos she insists on using the flashy box to annoy me. Yes, that’s a dog on the bed. Wanna make something of it? Let’s try one more! Whadda you say? Phoebe and the gang at 15 and Meowing and their Mom Ellen elected 1024 and … hey, it’s a big orange rock foto. We have a few of these in the condo. I still remember when TW bought them. The concierge picked up the box and axed her “what’s in here? Rocks?” Yep, that’s what they are. Rocks that are nightlights AND air purifiers. I have an affiliate ad on the bottom of the page for the Himalayan Salt Shop where we bought them. I like the Bird-tv view from atop the armoire. Go find someone else to bother, TW. I hope you’re still enjoying this feature as much as I enjoy writing it up. Sorry these fotos aren’t embarrassing to TW, except she cringes that she couldn’t edit my eyes and blur the backgrounds. First one to tell me what’s in those bottles behind me in the foto above wins a crushed crinkle ball. Heh heh! 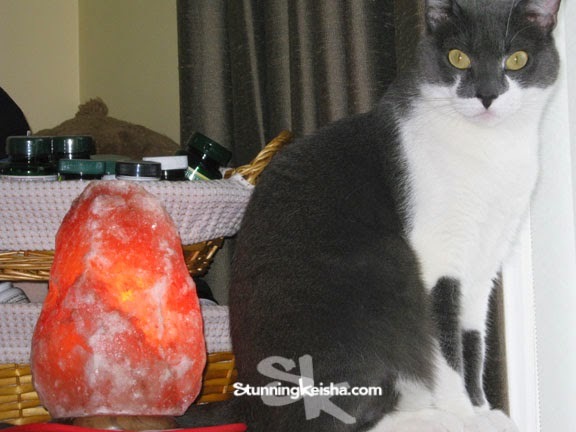 My human has always wanted to get one of those salt rock things - maybe she should use your affiliate link. I don't know what's in dose bottles - dey look kinda like my momma's vitamin bottles to me. Himalayan salt is all the rage here. Have a fabulous Friday. We like the salt rock - we have our eye on one of those too! That is a terrific colorful photo. Our mom would definitely use one like that for Caturday Art. Hope you will join us Sunday for our Selfies Blog Hop. XOCK, Lily Olivia, Mauricio, Misty May, Giulietta, Fiona, Astrid, Lisbeth and Calista Jo. We're not first, but we recognize vitamin bottles! We too would have guessed vitamins but we are like the zillionth cat to guess that. MOL We like your chose a number post.WE hope you continue. another grate round oh numbers picked by everee one N stunning fotoz by yurz troo lee....that bee in...ewe !! Please do. We’d appreciate it. Can you guess what kind of vitamins? I think you look like you are about to show that tissue paper who the boss is in the first photo. You look very glamorous sitting next to your salt rock. Great photos! Those Himalayan rock things are really cool. I've seen those around here before. I think the orange color compliments your fur really nicely. These posts are so much fun! The head peep says she hasn't seen one of those salt rock things in years. She would worry about the neighborhood deer breaking in and licking it the way they run wild around here. We sure are enjoying the photos CK! You've got a lot of toys to choose from in that first foto, CK. They look like spices or seasonings to me. But I may have been blinded by the stunning cat and rock in the foreground. Excellent posing with your toys! And hey, we think Bird TV is pretty good most anyplace, but when you got a primo spot - fantastic! Hmm, we don't know what kind of vitamins they are in the background...but we love you with the salt lamp, very cool photo!